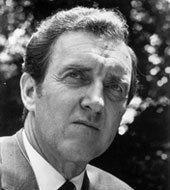 Edmund Sixtus Muskie served as President Jimmy Carter’s Secretary of State from May 8, 1980 until January 18, 1981. A long-time U.S. Senator from Maine, Muskie was tapped to serve as Carter’s second Secretary of State after the resignation of Cyrus Vance following the failed rescue of the American hostages in Iran. Born in Rumford, Maine, March 28, 1914, Muskie graduated from Bates College in 1936 and Cornell University Law School in 1939. He was admitted to the Massachusetts bar in 1939 and the Maine bar in 1940, and began the private practice of law in Waterville, Maine, in 1940. Muskie enlisted in the U.S. Navy during the Second World War and served in the Atlantic and Asiatic-Pacific Theaters from 1942 to 1945. After holding a series of local offices, Muskie was elected to the State House of Representatives in 1946, 1948, and 1950. Muskie was elected as Governor of Maine in 1955. In 1958 Muskie was elected to the U.S. Senate and was reelected in 1964, 1970, and 1976. During his tenure in the Senate, Muskie served as the Chairman of the Budget Committee and as a member of the Senate Foreign Relations Committee. Muskie achieved national notoriety as the unsuccessful Democratic candidate for Vice President of the United States in 1968 and lost the 1972 presidential nomination to fellow Senator George McGovern. While serving as Secretary of State, President Carter awarded Muskie the Presidential Medal of Freedom on January 16, 1981. After leaving public office, Muskie returned to private practice in Washington D.C. and served as a member of the “Tower Commission,” which investigated the Iran-Contra Scandal. Muskie resided in Washington D.C. until his death on March 26, 1996. Following the resignation of Cyrus Vance, President Carter envisioned Muskie’s role as more of a senior statesman and spokesman for the Administration, while leaving the everyday management of the Department of State to Deputy Secretary Warren Christopher. In the nine months Muskie served as Secretary of State, he conducted the first high-level meeting with the Soviet government after its December 1979 invasion of Afghanistan. During these negotiations, Secretary Muskie unsuccessfully attempted to secure the withdrawal of Soviet forces from Afghanistan. Muskie also assisted President Carter in the implementation of the “Carter Doctrine,” which aimed to limit Soviet expansion into the Middle East and Persian Gulf. Finally, under Muskie’s leadership, the State Department negotiated the release of the remaining American hostages held by Iran.